These six narrow-angle color images were made from the first ever "portrait" of the solar system taken by NASA's Voyager 1 spacecraft on Feb. 14, 1990, when the probe was about 4 billion miles (6.4 billion kilometers) from Earth. Clockwise from top left: Venus, Earth, Jupiter, Neptune, Uranus and Saturn. One of history's most iconic photos turns 25 years old Saturday (Feb. 14). On Feb. 14, 1990, NASA's Voyager 1 spacecraft took a family portrait of the solar system, capturing Neptune, Uranus, Saturn, Jupiter, Venus and Earth — which showed up as a "pale blue dot" — in a single view. The late astronomer Carl Sagan referenced and further immortalized the photo in the title of his 1994 book, "The Pale Blue Dot: A Vision of the Human Future in Space" (Random House). Sagan was part of the Voyager imaging team when the picture was taken. On Feb. 14, 1990, NASA's Voyager 1 spacecraft took a series of pictures of the sun and planets, generating a solar system "portrait" that includes Venus, Earth, Jupiter, Saturn, Uranus and Neptune. Voyager 1 and its twin, Voyager 2, launched a few weeks apart in 1977 to conduct an unprecedented "grand tour" of the outer solar system. Together, the two probes gave researchers some of their first good looks at Jupiter, Saturn, Uranus and Neptune, as well as the moons of those big, gaseous planets. Both spacecraft then kept right on flying. In August 2012, Voyager 1 became the first man-made object to reach interstellar space; Voyager 2, which took a different route through the solar system, should achieve the milestone soon as well. Portion of the famous solar system portrait taken on Feb. 14, 1990 by NASA's Voyager 1 probe. Earth is visible as a pale blue dot at right, in the yellow bar. 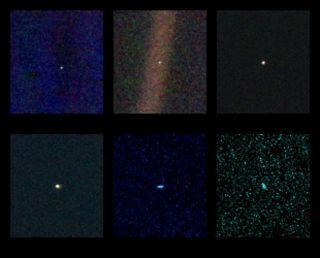 The series of images that comprise the "pale blue dot" portrait were the last that Voyager 1 took. The probe's handlers turned Voyager 1's camera off to retask the computer controlling the camera for other purposes. "After taking these images in 1990, we began our interstellar mission. We had no idea how long the spacecraft would last," Stone said in the statement. Voyager 1 is now about 130 AU from Earth. If the probe tried to photograph Earth right now, the planet would appear about 10 times dimmer than in did back in February 1990, NASA officials said.